Finally, FINALLY!!! 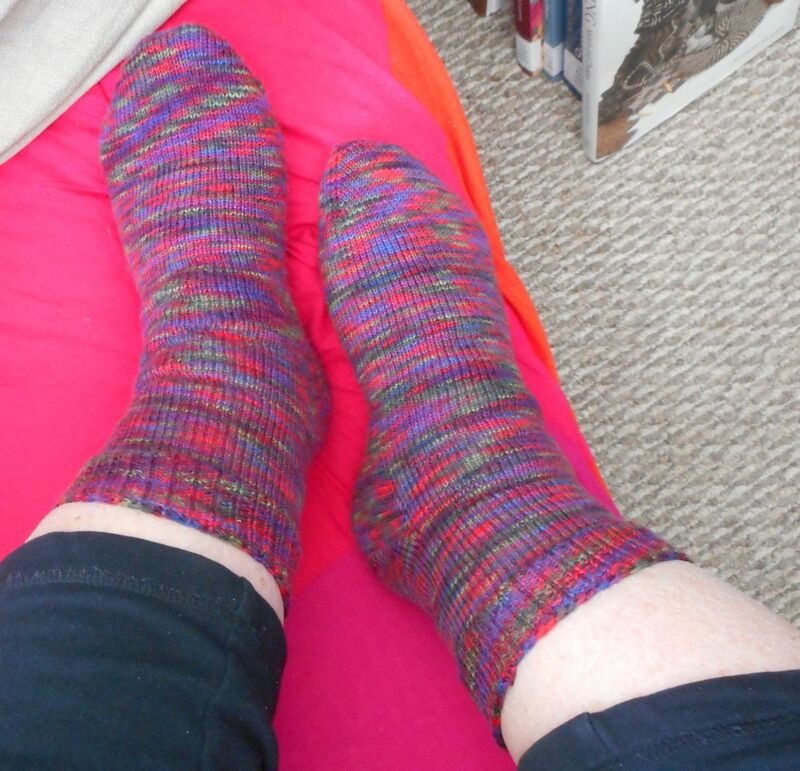 the Incredibly Boring Socks are finished. I love the colours, I love the finished fabric, I love the fit. But knitting them was brainmelting just because the colour sequence was SO predictable: 3 stitches of red, 3.5 stitches of blue, 3 stitches of green, over and over and over and over and ... well, you get the idea. My brain has just been totally spoiled by the stimulating variety of handpaints, the random colour sequences/combos of Crazy Zauberballs, and other fun yarns. 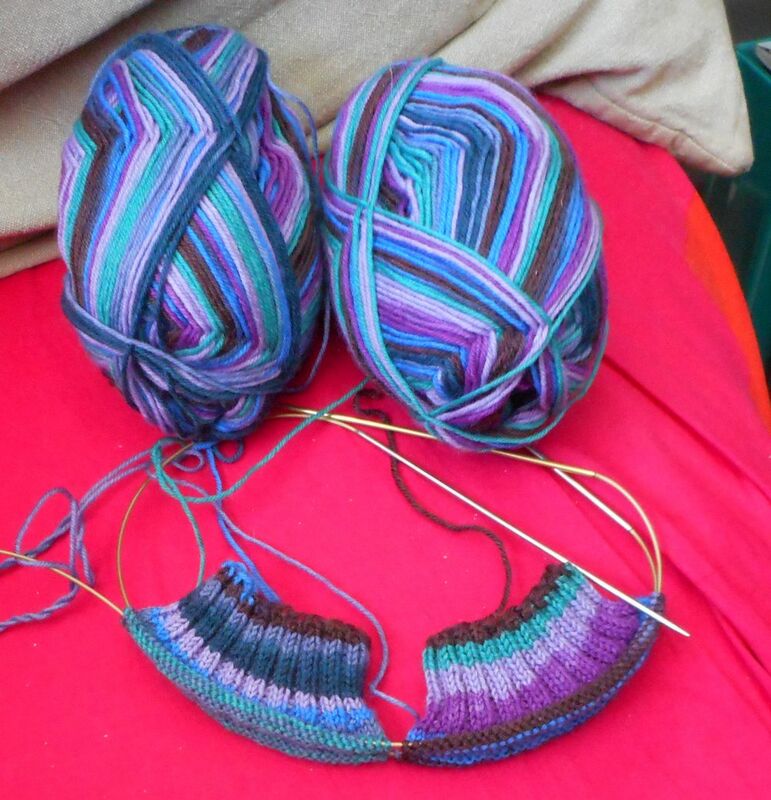 And, before the needles even had time to cool off, I cast on a new pair of socks, this time in totally non-boring Regia Kaffe Fassett Design Line. 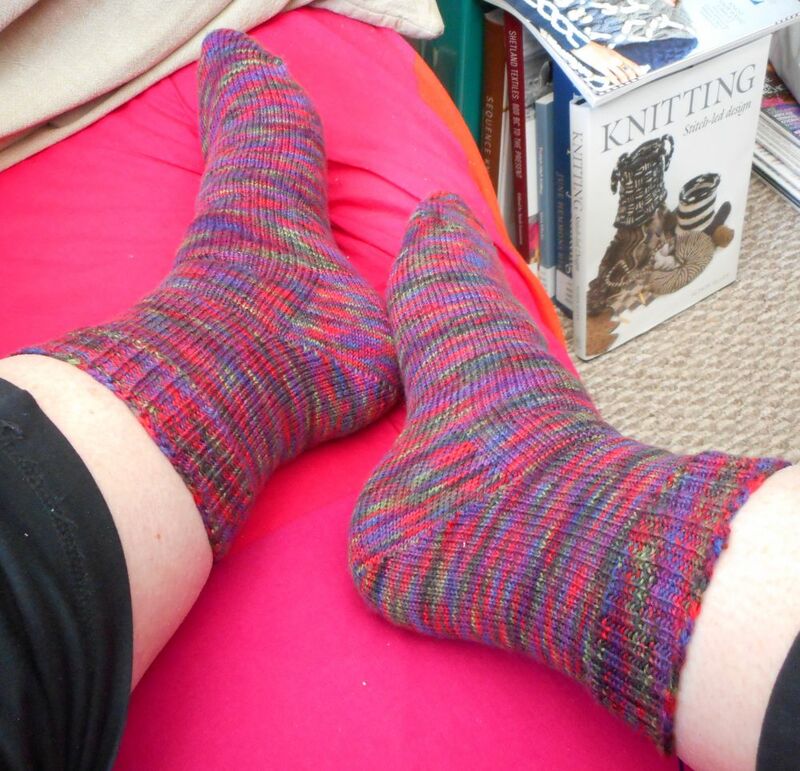 While there IS a colour repeat eventually it takes 9 cm (nearly 4 inches) of sock for that to happen. And Kaffe’s stripes have an assortment of wavy/bumpy/blurred edges instead of boring ol’ straight lines so I get to look forward to discovering which colours will do what (I’ve knitted socks with this yarn before, in a different colourway, so I know it’s going to be fun). Also trying a new pattern with an interesting heel construction that makes the socks reversible: Vanilla is the New Black by Anneh Fletcher (I already know I’ll prefer to wear ‘em stockinette stitch side outwards but that doesn’t make the concept any less cool). So onwards, hopefully much faster! This entry was originally posted at http://jlsjlsjls.dreamwidth.org/1337608.html. Please comment here or there (using OpenID), whichever is most convenient for you.